Mirage Diner | Oh No! Not Another NYC Food Blog! Huge shiny old school diner (with liquor) in Gravesend. 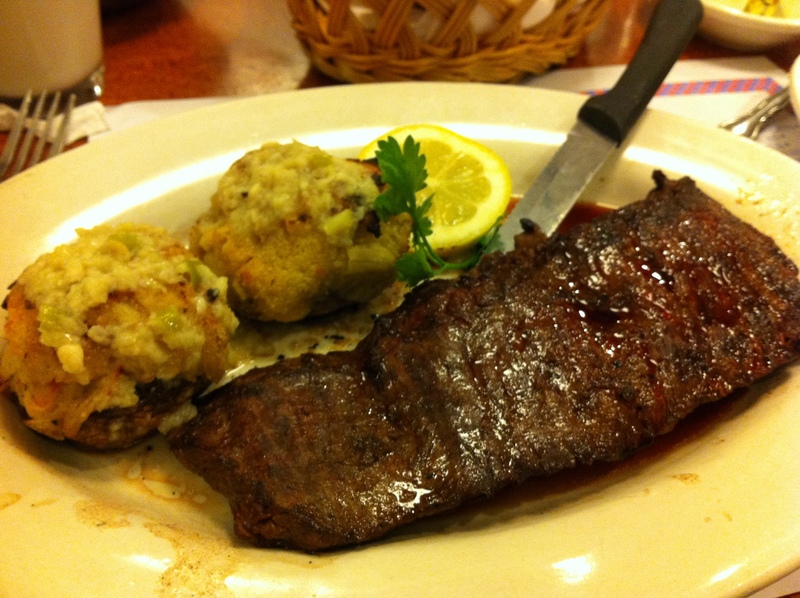 I ordered the Roumanian Steak & Two Stuffed Mushrooms Combo, which came with soup, salad, potato and vegetable. I opted out of the salad, and took matzoh ball soup, broccoli and mashed potatoes. The matzoh ball soup tasted like someone’s nanna was in the back making it – flavorful broth with that particular mouth feel only present with home made stock, lots of chicken, light matzoh balls – this was a satisfying cup of soup. The Roumanian Steak (more familiar to me as vaco or flap steak) was tender but under seasoned – still tasty though, and surprisingly cooked to temperature (rare). The mushrooms gave me flashbacks to the “fancy” stuffed mushrooms my mother made when I was a child – mushrooms basically stuffed with a crab cake – moist and flavorful too-salty stuffing with small dice krab broiled in a large button mushroom cap. Too salty by half, but still yum. And it went downhill from there: the potatoes were real, but mealy, underseasoned and gross; and the broccoli was a sad little dish of watery steamed-to-death greenery better left as a garnish. Things did not improve with my DH’s dish. 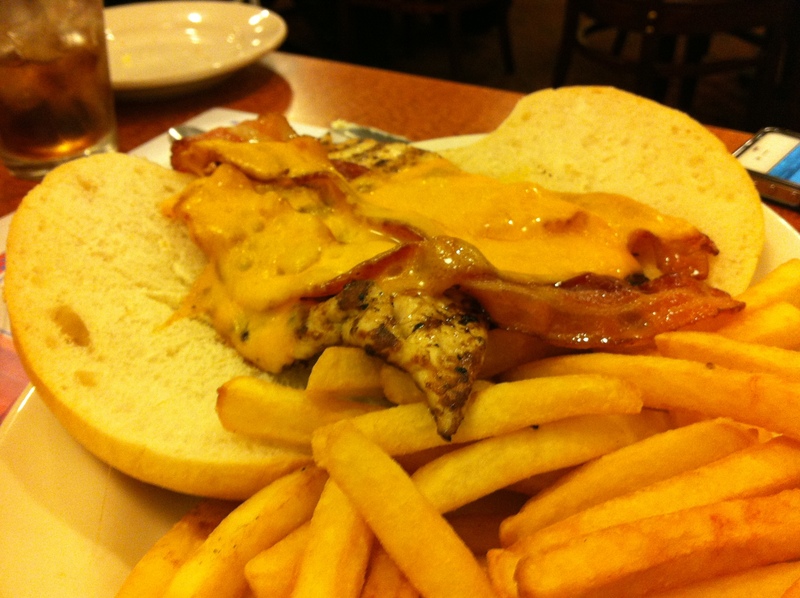 He ordered the Chicken Santa Fe Sandwich with fries – I’m not sure what was ‘Santa Fe’ about this sandwich — a badly cut and pounded sad breast of chicken cooked until bone dry and topped with cheddar cheese and limp bacon. At least the fries were good. Our meal also came with a wide variety of generously-portioned table food: cole slaw, pasta salad, and an assorted breads basket (challah slices, whole wheat cranberry rolls, sesame sticks, and something I can’t remember). The slaw was ok (rather like KFC), and the pasta salad was another edible childhood throwback. Where’s the jello salad? Very 80s – lots if hunter green and pink. Slower than molasses. Most of the black vested servers were bordering on retirement age; ours was not, but I think we expended his English and I have a feeling his youthful muscles were in high demand in the back. These people are hell bent on stuffing you to the gills before you leave. If you walk out the door even remotely close to not collapsing into a food coma, it’s your own damn fault. And, with the crazy amount of dishes on the menu, everyone you know is liable to find something they want to eat. This place also has crazy deals – There is a large specials menu with soup or salad, appetizer, entree & dessert for $19. The clientele (at least during our visit) was in the over 60 category, which might just explain the lack of seasoning. 3 out of 5 for the tenderness of the steak and the selection. Don’t go for the chicken. Bring your own seasoning.